The ‘road novel’ might be one of the most maligned forms in storytelling, in that for a mold that by in proper handling could be kinetic, shapeshifting, and packed with an uncontainable kind of light found only in certain kinds of travel, too many books get caught up in minutiae and joking, leaving out the language and the true moving meat. 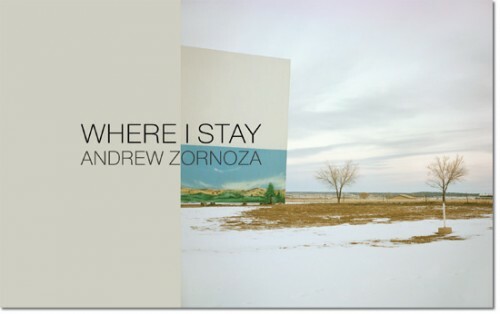 Thankfully, Andrew Zornoza’s Where I Stay, just out from Tarpaulin Sky Press, manages to not only wield that rare light while avoiding those common pitfalls, but to do so in a refreshing, pitch-perfect kind of steering that is innovative not only for the genre it might get called into, but for experiential and language-focused texts of every stripe. While each graph and location could be self contained for Zornoza’s striking lines, meditative and rhythmic in the mind of Mary Robison mashed with William Vollmann, the prose in sequence forms a narrative of seeking, of looking for something familiar in so much splay. The unbounded point-to-point of the narrator’s surroundings, in which he works strange crap jobs, meets roadside strangers, deals with his life, contains no abject want for summation, and yet therein reaches beyond⎯the narrative in beautifully and concretely rendered fragments evicts a true sense of drift, though within the drift, the body. And yet for something seemingly so everchanging, there is a center here. A lock. The moments of pure human magic are abound. Certain page of Where I Stay, in their collision of texts and image, move in such a precise and startling way that at certain points it seems necessary to stop and close the book, to let its image sink deeper, strong in the head. Zornoza’s knack for rendering the momentary in timeless, syllabic lines, to cut to the blood of the line in an effortless, truly fevered sort of way, is not only refreshing, it is unforgettable. Though he is smart enough to keep the moment by moment phrasing quick and vivid, line by line, there are no exits pulled in the overall collage that results from all the wanting, from the haunting viscera there contained. ** Buy Where I Stay now from Tarpaulin Sky.